Kick 2017 out with donation to fight for climate – Mainstream Green, Inc.
Will you remember 2017 for the devastating floods? Monster hurricanes that ravaged Houston, Texas, South Florida and completely destroyed Puerto Rico? Uncontrollable fires? Blue algae poisoning fresh water sources in CNY and all over the USA? One of the largest oil spills in North America, more than 200,000 gallons of crude oil spilled from Keystone pipeline? One thing you won’t want to remember is that 2017 was “the” year you didn’t do ALL you could to fight climate change. Climate change is the most dangerous social justice and geopolitical issue EVER in human history. When food and water are most scarce, who will have it and who will not? When severe weather destroys more communities, which ones will see the most suffering but least resilience or reinvestment? Will Puerto Rico be the example of what will happen in poor communities all over the United States? Please join the fight today, with a donation to Mainstream Green, because climate change is here, it is growing, and humans can no longer afford to ignore it. 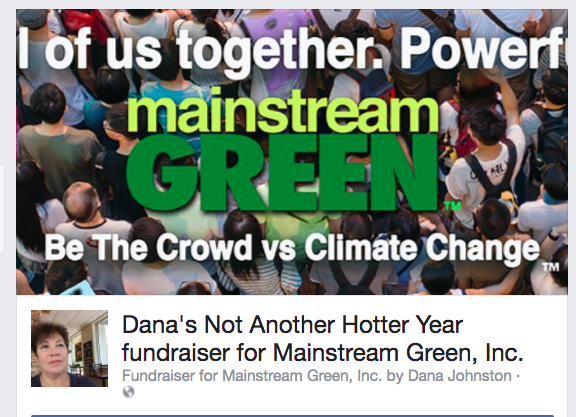 Mainstream Green has posted a year end fundraiser on Facebook: Dana’s Not Another Hotter Year fundraiser for Mainstream Green, Inc. Please donate there (or use the link or mailing address on this page) and then share it on your timeline, and ask other people to donate, also. Any amount will help. Facebook accepts donations and passes them along to us for free. Your donations are TAX DEDUCTIBLE (for the last time this year!) because Mainstream Green, Inc. is a 501C3 nonprofit corporation.